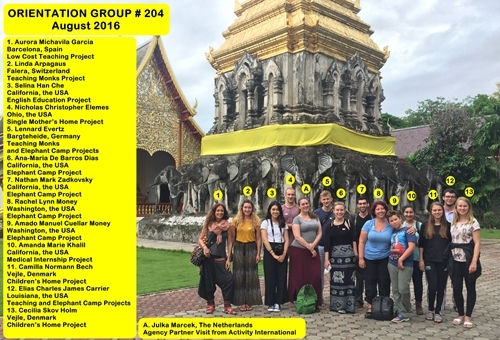 Presenting Chiang Mai Volunteer Group 204! A great group of 13 new volunteers and interns, along with a visitor from one of our recruitment partners. The group completed orientation over the weekend and started in their projects on Monday. In this group we have volunteers and interns from Spain, Switzerland, the USA, Germany, and Denmark. The participants in this group are partaking in our Medical Internship, Children’s Home, Single Mother’s Home, Elephant Camp and Teaching Volunteer Projects.